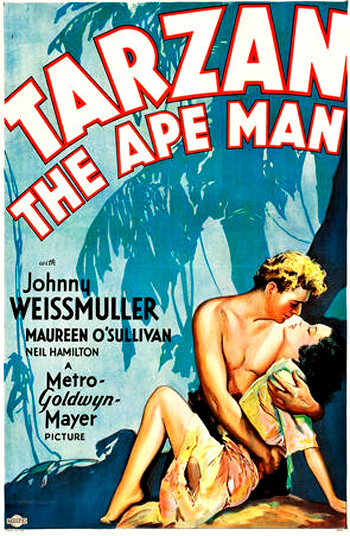 Tarzan the Ape Man (1932) is the first feature-length talking (sound) version of the Tarzan series. The Tarzan saga was based upon the original 'Lord of the Jungle' characters created by novelist Edgar Rice Burroughs. The Tar-zan character (called various titles through the years, including John Clayton, Lord Bloomstoke (Greystoke)), first appeared in late 1912 in All-Story Magazine. This entertaining film, directed by W.S. Van Dyke, used extensive, left-over African jungle location footage from MGM's early talking adventure film Trader Horn (1931), also by Van Dyke. Film production costs reached $1 million for the studio. The quintessential adventure film tells the exciting story of a difficult African trek to the fabled elephants' burial grounds, where vast amounts of valuable ivory tusks are thought to be located. Traders are exploring and searching for the unexplored burial place beyond the Mutia Escarpment - a mysterious, wall-like barrier of mountains. There are superstitious beliefs among the natives that the escarpment is sacred and anyone who looks or ventures beyond the escarpment faces death by the "witchmen of the tribe." Planning for a dangerous trip is James Parker (C. Aubrey Smith), leader of the African safari, and his young associate Harry Holt (Neil Hamilton). Parker's daughter, the lovely English girl Jane Parker (Maureen O'Sullivan) arrives in Africa to be with her father and join him, but Parker thinks the trip will be too dangerous for her. She admits that she is "very obstinate" and insists on going along: "From now on, I'm through with civilization. I'm going to be a savage, just like you." As she talks to her father, her six trunks from her voyage from England are delivered, she changes down to a revealing slip, and she cleanses her face with cold cream to "preserve that schoolgirl complexion." Jane demonstrates her knowledge about "why one never finds a dead elephant in the jungle." She describes the secret graveyard of the elephants: "...An elephant can always tell when death is coming for him. And when he hears the call, there's a secret place to which he wanders. A place where he can lay his bones with his ancestors. A place of rest." As they prepare for the journey, Parker tells Jane and Holt that there is "enough ivory to supply the world. There's a million pounds for the man who finds it." She turns to Holt and flirtatiously commissions his support for her accompaniment. Holt: ...You know, Jane. I'm not a romantic sort of a person or anything like that, but if we, uh, if we get through this all right, is there any kind of a chance for me? Jane: With me? I don't know. I-I haven't thought about it much? Holt: Well, will you? I thought I hated this country. Since you're here, I almost love it. Jane: Do you Harry? I'm very glad. Jane: Glad you like Africa. Animal sounds come out of the darkness, but Jane is unperturbed, expressing her oneness with the jungle and the wilderness: "A horrible noise, isn't it? Then, I don't know. It's part of it all...Love it, who wouldn't? Look. Isn't it marvelous? And the funny part is, I feel so completely at home." Soon, they reach the steep escarpment and have to climb up and around its torturous cliffs. Harry warns everyone about a narrow crevice on a dangerous ledge: "It's a bit tricky here," but one of the native bearers carrying a pack of medicines and trade goods misses his footing across the gap and plunges to his death. "Poor devil," Holt remarks. Jane falls in the same place, but is saved by a rope. They continue on their trek, choose a resting place, and then hear a long animalistic cry - the first time Tarzan's trademark jungle call is heard: "Aaah-eee-aaah." Jane asks: "What was that?" Holt doesn't know: "Can't say." One of the native bearers (Curtis Nero) suggests: "Maybe hyena, bwana." When the call is sounded again, Parker states: "That was a human cry." Jane stands up and exclaims: "Human?!" Everyone in the safari becomes nervous and restless, and Parker considers turning back, but Jane refuses to halt the party and quit, and encourages them to continue on: "Darling, I know why you're saying that, and I'm not going to be made an encumbrance of. I'm not frightened of a few weird cries. Now let's get that ivory." They forge ahead on their journey even though the uneasy natives must be whipped to proceed. They follow the tracks of an elephant herd to the edge of a wide river. There, after building two rafts, in an exciting scene, they cross the hippo-infested river. The herd of hippos capsizes one of the rafts, causing the deaths of two of the men by crocodiles. As they are threatened by the large animals - which follow them up the other side of the river bank - they hear the strange jungle cry twice more, and the hippos appear to back off and return to the river in obedience to the sound. While the group is preparing to set up camp, they notice a jungle-yelling, vine-swinging, illiterate (unspeaking and mono-syllabic), loin-clothed, but gentle, childlike, and protective ape man - Tarzan (Johnny Weissmuller). When distracted by savage pygmies, Jane is suddenly kidnapped by Tarzan - he whisks her away, carrying her back to his tree home among a group of apes. She screams and kicks as he carries her into the treetops. She is terrified of the heights, begging him: "Hold on to me." When one of the giant apes approaches, Tarzan clearly doesn't understand her words as she screams hysterically: "Oh, he's coming at me! Oh, don't let him take me," but Tarzan protects her. She meets the chimp Chetah for the first time - in a gesture of friendliness, he puts his arm on her shoulder. They are both curious about what she is wearing, until they are threatened by a leopard from below. Tarzan leaps on the threatening animal and kills it. After Tarzan carries her and swings her to another part of the treetops, he grabs her again and she screams repeatedly: "Let me go," but she cannot escape his powerful grasp. When she is finally released, Jane sleeps in Tarzan's tree house/home for the night. He has provided her with a leopard skin to sleep on and made a screen around her with vines. Next to her covered home, he stretches out on a large tree bough to sleep. When he awakens the next morning, he grabs her again, and she screams hysterically, but she falls into Tarzan's arms for protection when the giant ape threatens one more time. She thanks him with a simple: "Thank you...Thank you for protecting me."